Our mantels are better than our competition’s for several reasons. First we use state-of-the-art panel processing equipment and the best materials possible for all the large flat mantel parts. Since your mantel is being installed around a fireplace it is being subjected to sharp differences in temperature. Temperature changes causes wood to expand and contract which can cause wide pieces of solid wood to warp, cup and split. Therefore, we use MDF (medium density fibercore) covered with a wood veneer rather than solid lumber for all our wide flat pieces. The MDF material should not be confused with particle board which is actually a low density material. MDF will not warp, split or cup and in this application we feel is a better material. We cover the MDF core with the best grade of veneer available. We use an A grade plain sliced veneer on all oak, pine and cherry mantels which gives you the look of solid material with the advantages of MDF. Each flat part is cut out on our automated panel saw that insures squareness of all parts and a perfect cut. Our employees and staff make the difference – we are always striving to be America’s Premier Mantel source for you. 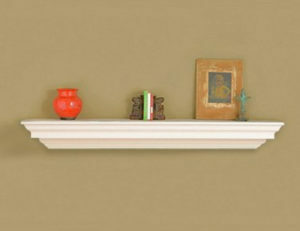 Premier Mantels are available in several standard sizes and almost any custom size. The mantels are available in Oak, Cherry, Maple, Poplar and Paint Grade Woods either finished or unfinished.